Our paracord medical ID alert bracelet is great for kids, teens, and adults too. Made with your choice of paracord color. 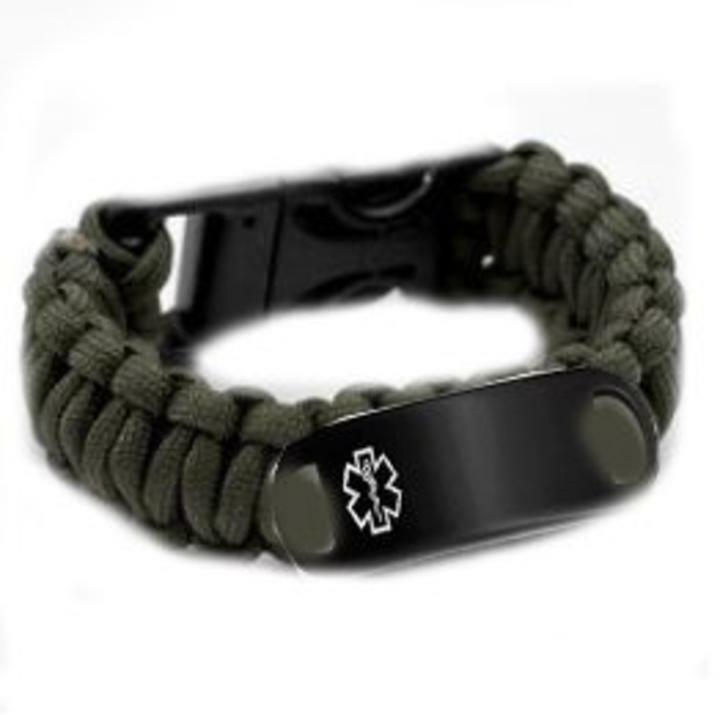 The medical ID tag is atached using O rings directly to the paracord medical bracelet, which you can open up to interchange your medical tag to a different paracord band or stainless steel chain. Our custom engraved medical ID alert tag is black stainless steel that is very easy to read, highly visible and engraved with laser engraving.The medical ID alert tag imeaures 1 1/2 x 3/8 Inch. Engraving can be done on both front and back! 4 Lines on engraving of front with 18 characters per line including spaces and 4 lines on the back with 25 characters per line including spaces. The 3rd photo shows how the tag is attached using O rings making is great to have different bands.